Last week I had to get a CT scan of my head. I asked for a copy and the hospital gave it to me on a disk. When I mounted it on my Ubuntu desktop and tried to open the image I got an error “No Application for Opening DICOM Images”. But what I loved was that it offered to find a program that could. Within a minutes I had Ginkgo CADx installed and was looking at my skull. Okay, so I was all excited that we were opening an office in Georgia. Over the years we have had employees in other states outside of North Carolina (Ohio, Massachusetts and Georgia) but since we never had an actual office presence in those states, they officially worked out of the NC office, and so I withheld NC taxes and unemployment for them and they filed NC tax returns as out of state workers. Now that we have an actual office in Georgia, I thought I’d better start withholding GA taxes and unemployment. So I contacted my payroll provider to make this happen. I have been using Quickbooks on the Mac for bookkeeping for many years now, and their preferred payroll provider was a company called Paycycle. I liked Paycycle and never had much trouble with them, but several years ago they were purchased by Intuit and things have gone downhill. When I contacted Intuit about adding the new state (which used to be pretty easy under Paycycle) I was told I would need to upgrade my service, basically doubling my cost. Considering the time I would have to spend in switching to another provider, I agreed to the change. Thus began my descent into Payroll Hell. The moment they switched my service, my Payroll To Do list filled up with seven years worth of tasks requesting me to enter in state tax information, not only for NC but for OH, MA and GA. As I was heading out at the time for a three week trip to Europe, I didn’t think much of it and figured I could fix it with a phone call when I got back. I should have found the time. The night that payroll was due for January, I was in London. Usually the payroll process takes less than five minutes, but this time it wouldn’t complete, with the system throwing a very unhelpful error message. I was lucky that the hotel had decent Internet access, so I was able to contact Intuit support on-line and after about two hours they managed to get the system to allow me to run payroll. That is when I found out that even though they doubled my fees, they were not going to electronically file my state taxes (sigh). When I returned to the US I made getting the payroll system fixed a priority. So I called Intuit support again and thought that my request, to simply set the state taxes history to start on 1 January, was a simple one. After spending another two hours on the phone, I was told that the only way I could get the system back to normal would be to enter in values for state taxes going back to 2006, for all four states. Not happening. I told they guy to just put the system back to where it was before, and he said he couldn’t do that as the service would now be “Basic” and not include electronic filing of Federal taxes. Again, all of these different levels of service obviously point to the Intuit influence, as Paycycle was pretty much a devotee of the Apple method of simplicity. I told the guy to forget it, and I would find another solution. My first stop was the Bank of America site. I’ve been a client of theirs for decades, but it turns out that their payroll solution is provided by Intuit. No way I was going down that path again, but I did notice that it was considerably cheaper to get it through BofA and that electronic filing of state taxes was included. Another way that long term clients like myself were getting screwed. When I look for vendors, I like to visit the list of OpenNMS Group customers. It turns out that ADP is a client. Now it is ADP Dealer Services and not the ADP division that would provide my payroll, but I like patronizing companies that patronize us, so I signed up. Our February payroll should be handled by them. It generated an error asking me to fill out the interview I just filled out. Another call to Intuit, another 30 minutes or so on hold, and I’m told that I have to clear the state tax “to do” items, the very reason I’m canceling the service, before I could cancel the service. I’m afraid I went a little non-linear. After my rant, I sat on hold for ten more minutes until I could speak with a supervisor. She was able to cancel my account. My goodness, maybe they should put her on the front lines. Anyway, just wanted to post my experience in case any of my three readers was considering using Intuit Payroll services. In a word, don’t. I don’t know much about the network infrastructure company F5. I know some of our users have their gear, and I’ve heard positive things about it, but one place where F5 fails is in its legal department. F5 offers instructor-led courses that provide a hands-on learning environment, real-world problem-solving activities, and immediate constructive feedback. Our courses follow an aggressive schedule of accelerated lessons covering many of our application delivery networking products. The information in this notification is accurate, and I swear, under penalty of perjury, that I am the copyright owner or am authorized to act on behalf of the owner of an exclusive right that is allegedly infringed. This, to use a complicated legal term, is complete crap, at least with respect to the referenced links on our website, and it makes me angry that this kind of sloppy research is allowed to pass just because F5 has a lot more money than our little project (and apparently uses it to hire lazy legal help). I don’t really have an opinion on the original complaint. It does appear that most of the links do point to web-based study sites which may have lifted questions from F5 tests. It is a long tradition to provide study questions for exams, but if they did actually source those questions from F5 copywritten material without permission I think F5 has a valid issue. What I strongly disagree with is that our project is grouped into that list when it is quite obvious that none of those links references F5 material. Heck, one link is to an IRC log that only contains the characters “F5” as part of a hex string. I’m not too worried about it. The notice was not aimed at us, and Google would be stupid to de-index those pages (at the moment it appears they haven’t). What worries me is this trend where large companies use vague laws like the DMCA coupled with lazy legal work to bully others. UPDATE: It does appear that Google has de-indexed those pages. Luckily, they have an easy form you can fill out to file a counter-notice, which I have done. I got an e-mail verifying receipt, but with a notice that it may take some time, but I’ll keep updating this post with the status. If you haven’t booked your trip to Fulda for the OpenNMS Users Conference, you should do so soon. It promises to be full of awesome, and I for one am excited to be in the audience for once, listening to the ingenuous ways people have come up with for using OpenNMS. One talk in particular has caught my eye. It’s by Jan Stoetzer and it’s called “Automated Orders of Consumables Using OpenNMS“. One of the tasks of our OpenNMS installation is to monitor the page counters and toner levels of our printers, copiers, faxes etc. Out there the idea to was born to automatically reorder toner. Meanwhile our OpenNMS is able to order every supply. Toners, developer units, ozone filters, theoretically even soda cans for Tarus’s OpenVND drink machine. In this short talk I want to show you how we realized this. This is one of the great things I love about open source. I scratched an itch and built a monitorable soda machine, and now someone has taken the basic premise and extended it. This is the first conference event organized by The OpenNMS Foundation, an independent non-profit created to promote OpenNMS, and it is the first conference event that is focused totally on end users with content from end users. I look forward to getting my OpenNMS geek on with everyone in a few weeks. Things are really rolling at OpenNMS, and we’re only a few weeks into the year. I am happy to announce that we have officially opened a regional office in Marietta, Georgia. The hope is to leverage the talent in the area for some of the positions we have available and to provide an alternative for people who don’t want to relocate to North Carolina. Also, we are renting out space in that office for co-working, so if you are in the area and would like a cool environment in which to work, drop me a note. On February 2nd I found myself with great seats to a world championship sporting event. No, it wasn’t the Super Bowl, but for the details, read on. When I was last in Europe, not only did I spend some time in London, I also got to spend some time in Sweden. We are doing a lot of work there (more details soon) and I expect to be visiting a lot, but this was my first trip. It was pretty cool. We are seeing a lot of interest in OpenNMS from Nordic countries. Things are booming there while the rest of Europe struggles – so much so that The Economist ran a special report on it. I’ve been to Norway a couple of times and Denmark once, and I’ll be in Finland later in the year so it was nice to get the set with this vist to Sweden. I had to rent a car to get where I was going, so I walked up to the Avis counter and asked for a Swedish car, seeing as how I’m in Sweden ‘n all. I had checked the Volvo S60 box when I ordered, so I was ready to tackle this country in all its Scandinavian glory (I stopped short of putting ABBA in my music collection). They rented me a Peugeot. A Peugeot 508. Not only was it a French car, it was a diesel hybrid French car. When I first got into biodiesel I thought a diesel hybrid would be a great idea. When diesel cars idle they don’t use much fuel, so a hybrid wouldn’t need to always turn off the engine in order to save fuel when the electric motor was running. But it was pointed out to me that diesel’s peak power is at low RPMs, just like with an electric motor, and it was questionable whether they would benefit each other. Considering the extra weight, cost and the production of rare earth metals that goes into an electric hybrid, it probably won’t be a great idea either for the car or for the environment. Well, I thought I could. I have driven a Prius so I wasn’t thrown by the little shifter thingie that only had two directions, forward and back. When I finally got moving I thought something must be wrong, since every shift felt like the car momentarily stopped, throwing me toward the windshield and then slamming me back as it shot forward. In all fairness, it did have a manual mode and paddle shifters, so maybe it was supposed to be driven like a manual car. Who knows. Sweden was not at all what I expected. I have been to Norway a couple of times and I expected more of the same, sort of like one might expect Arizona and New Mexico to be two sides of the same coin. However, this part of Sweden was very flat. So flat that there were huge windmills (the make energy kind and not the Don Quixote kind) everywhere. It was kinda cool. I arrived on a Saturday so the client had arranged for a group of us to attend a game of “Bandy” while I was in Sweden. When she sent me the URL, the website was in Swedish and I just assumed that it was hockey. Turns out I was wrong. She managed to score tickets, on the ice, not only to Bandy but to the Bandy 2013 World Championship game between Russia and Sweden. When we arrived, we entered the area and went to a “members only” type restaurant on the second floor that looked out over the ice. The place had a bar and a buffet, and we had a table right over one of the goals. It was packed, but we got four seats next to the window. The first thing that made me think “this ain’t hockey” was the rink – it was huge. We’re talking soccer field huge, which is appropriate since I figured out later that Bandy seems to be more “soccer on ice” than hockey. While we ate, the teams came out to warm up and that’s when I noticed another major difference. Instead of a flat puck Bandy is played with a pink plastic ball. The ball is smaller than a baseball but bigger than a golf ball, and part of the game is to get it in the air. The sticks are also different. They are much more curved, and the goals are much larger than in hockey. They are taller and wider, with a height about that of a man. The goalie, by the way, has two large, round padded gloves but no stick. We finished eating before the game started. The place had filled up as we made our way to our seats in the front row near center ice. When the game started I tried to understand how it was played. This is where the soccer analogy came into play. There was no icing, no body checks, and no plastic wall protecting the fans from the ball (although that really didn’t matter). It was a physical game nonetheless, and fast. Like soccer, it consisted of two 45 minute halves and the clock never stopped – they simply added time as needed for penalties and other issues. They did have penalties and a penalty box like hockey, although the times were pretty severe. Of the four penalties I remember, one was for 5 minutes but the others were for 10 minutes each. When a team was playing light (a “power play” in hockey”), the penalty did not end when the other teamed scored. Speaking of scoring, Russia pretty much dominated. Their first two points came after the Bandy equivalent of a corner kick: The Swedes would all line up in front of the goal while one Russian player passed in the ball from a corner. Then three or four Swedes would shoot out and try to break up the play before they could score. They didn’t do so well on the first two. At halftime it was 2-1 Russia, and in the second half Russia scored its first “real” (non-corner kick) goal to make it 3-1, but the Swedes managed to score again late in the game to make it 3-2. Unfortunately, Russia scored another corner kick thingie with only 10 or so minutes left, and even though Sweden scored again they couldn’t pull off the tie in time. I say “10 minutes or so” since you couldn’t really tell when the game was going to end. Just before the 45 minute mark in the second half, a referee took a huge fall and wasn’t getting up. I didn’t see him get hit (that did happen a couple of times throughout the game) but he must of hit the ice hard because as they helped him off the ice you could tell that his legs weren’t quite working (not that they were broken but that it was having trouble keeping them under him). We ended up waiting about ten minutes for them to find a replacement and get him suited up, which I thought was a little weird for such an important game. Most soccer games have a alternate referee dressed and ready to go, and since this game is much faster than soccer I would assume refs get hurt more frequently in Bandy. I really enjoyed myself. While the Russians would cheer “Ruuus-See-Ah Ruuus-See-Ah” the Swedes would shout something like “Ya Ya Men-sah, Fah Tosh Bor-ah” and I struggled to learn it. I was sad to see the Swedes lose. Anyway, I’ve chalked this one up under my “weird international sports” along with Australian Rules Football and perhaps I can see another game some other time, as I look forward to going back. I travel a lot by air, and while I can tell you almost immediately what type of plane I am in from the inside, I have trouble identifying most planes from the outside. There are some notable exceptions like the Concorde or the Boeing 747 (my favorite plane) and quite often my confusion is due to a poor sense of scale: unless I see a Boeing 737 parked next to a Boeing 767 I can have trouble telling them apart. I brought this up with Alex Hoogerhuis when we met up in London, and he graciously spent about an hour explaining key points to look for when trying to identify a plane. The following is what I remember of that conversation. Anything I get right is due to Alex and anything wrong is totally my fault. If I use words like “tail” to mean both the rear of the plane and the bit that sticks up in back, don’t take it personally. Also, I am not ready to explore the various versions of each aircraft. For example, the 737 comes in a number of models, often identified by numbers such as “-200” or “-300”. So while I plan to tell you what I know about identifying a 737, I won’t get into the differences between a 737-300 or the rare 737-600. Alex could hold forth on such things. Finally, I stole all of the pictures. If you click on one it will take you to the site where I found it. My thanks to the creators (and just let me know if you’d rather I didn’t use it if you own it). Probably the most common narrow-body commercial jetliner in use today, if you have flown at all (at least in the US) you have likely flown in a 737. For example, the entire Southwest fleet is made up of 737 aircraft. It is called a “narrow body” jet because it seats a maximum of six people in a row, but I like to differentiate narrow body from wide body by the number of aisles: narrow body planes just have the one (note that all my notes about aisles and seats refer to the main cabin). Being so common, I am often thrown by the many differences between the models. When I used to fly Southwest, I liked the model where the first exit row was missing a seat. I would aim for the window seat in the second exit row so I could stretch out my legs where the missing seat would be, but most models have a full set of six seats in each exit row. So how can I tell a 737 without peaking inside? I am putting this plane next because I fly American Airlines and, unless I am going to Miami, I will be in a McDonnell-Douglas 80 (or Super 80 [S80] as American calls them) if I am staying within the US. I have spent several months of my life inside these things, so I am a bit nostalgic about them. That, and the fact that this was the first jet that Wilbur and Orville Wright flew just adds to the historic nature of the flight. Okay, yes, these bad boys are old, so old that I swear one I flew in was powered by coal, but they have safely gotten me out and back many times. They are narrower than a 737 and the main cabin setup is two seats on the left and three on the right (still with the single aisle). These are easy to pick out because they are roughly the size of a 737 but the engines are mounted in the rear of the plane near the tail. This is something to think about when picking seats as the rear of the plane can get quite loud. If I am not in any of the above two planes, I am flying from Raleigh/Durham (RDU) to Heathrow, London (LHR), on a Boeing 767 (or Dalles/Ft. Worth [DFW] to Frankfurt [FRA] on a 767). This is a wide body jet with a seat arrangement of 2-3-2: two seats near the windows and two aisles with three seats between them. It has the same general proportions as a 737 so I often have trouble telling them apart at a distance. However, the 767 lacks the little lead in fin of the 737 tail and the fuselage comes to a point at the end that is a perfect cone. Thus, if you are looking at a big plane and the tail ends in a cone, you’re probably looking at a 767. Every so often I end up in a 757. This is a plane about the length of a 767 but it is a narrow body aircraft with a similar seating arrangement to a 737 (3-3 with single aisle in the main cabin). I asked Alex how to tell the difference between it and a 767 since they are roughly the same length, and he pointed out that the cockpit windows on a 757 are lower than the windows in the main cabin. Also, he said to imagine a person standing on top of the line of windows along the side (he didn’t say this was a possible place to stand, just to imagine it). If a person could fit between the top of the plane and the top of those windows, you were looking at a wide body jet. If not, narrow body (since windows are pretty much the same size on any commercial jet except for the 787 Dreamliner which are larger). This is my favorite plane of all time. I think it is beautiful and I love flying in it. Well, I love flying in it as long as I am not in the main cabin, which is has a whopping 3-5-3 seat configuration that makes each row hold almost twice as many people as in a 737. If I have to sit in the back I aim to be way back. When the fuselage starts to taper in the back, they can’t fit as many seats in, so the “window” seats after extra space between them and the actual window. After takeoff you can move all of your crap over there for easy access while having okay legroom. The “triple seven” was aimed to be a replacement for the aging 747. American used to fly one on the RDU to LHR route and I loved the modern seats and in-seat entertainment, even in coach. But I got to fly in First Class in one once from Chicago to Narita and it was awesome. You get your own little pod-thingie that can turn into a completely flat bed and even sports a guest chair if you want to sit and talk with someone across a table. I used points to get my wife and I on this flight, and even though we were next to each other in the middle section (the seating in first is 1-2-1, versus 2-5-2 in the main cabin) the “pods” were so wide we’d have to stretch to touch hands. But how do you tell this big plane from other big planes? Look at the tail end of the aircraft. While the 757 and the 767 have cones, the 777 has a long, flat vertical paddle – almost as if it were a fish that lost its tail fin. Plus, its two engines are freakin’ huge. I have yet to fly on this plane, and with the current de-bugging going on it may be a while before I do. This is a great example where the higher number does not mean a bigger plane (the 737 is bigger than the older 727, but while the 757 is smaller than the 767, both are smaller than the 747). It was built to be extremely fuel efficient, very quiet and with a long range. With exceptions for things like luggage, it costs about as much to fly a plane half full as it does full, so airlines want full flights (and they are succeeding, if my recent travel is any indication) hence smaller planes, and more fuel efficiency translates directly to the bottom line. I have seen it, however, in FRA. 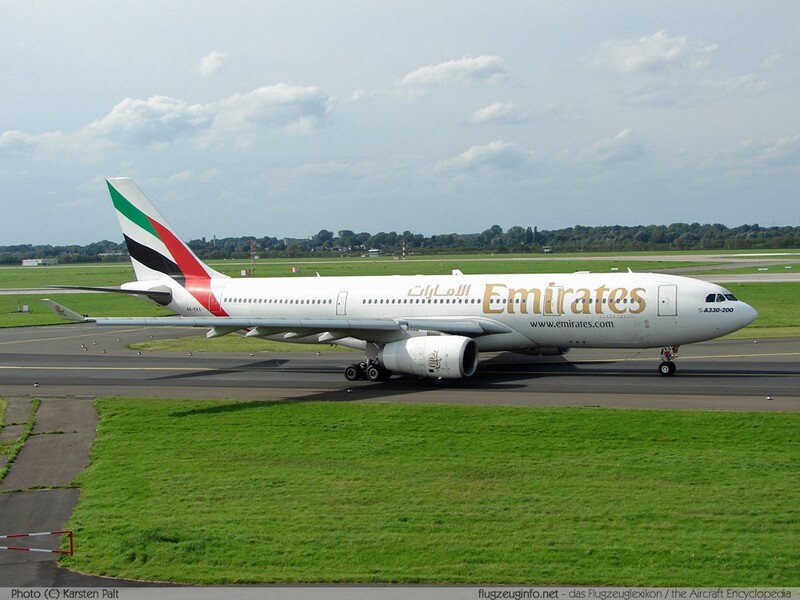 It looks small but it is slightly larger than the 767 but smaller than the 777, and it has larger than normal windows. I won’t worry about looking for other clues until they get more prevalent. Okay, that about covers the Boeing line up (there is a 717 that I flew intra-island in Hawaii) but there is that *other* plane manufacturer over in Yurrip known as Airbus. Since air flight distances intra-Europe tend to be shorter than in the US, Airbus has three planes that are used to serve most of that traffic, the A319, A320 and A321. Alex showed me this neat little picture where you can see that the main difference is length. If I am looking at a narrow body jet that doesn’t have the 737’s distinctive tail but still has two wing mounted engines, I assume it is an Airbus. If it has one exit row window over the wing, it’s an A319. If it has two exit row windows over the wings, it’s an A320, and two exit row windows positioned in front and behind the wings it’s an A321. Alex told me that each pair of exits accommodates 50 passengers, so you can count the exit windows and doors and know the approximate capacity of the plane. This is a cool plane. It is a wide body jet with four engines, but they look tiny, almost cute. If I see a plane with four wing mounted engines that isn’t a 747, I just assume it is an A340. I have flown on these a couple of times, but it is rare. Once was on a British Airways flight in business class, and the business class seats are arranged head to tail (i.e. the seats near the window face backward so that your shoulders are near the feet of the guy next to you, although a partition keeps that from being awkward). Besides being the safest way to sit in case of a crash, it is almost like having a little room if you are next to the window and the partition is up, and it is my favorite way to fly outside of first class on a 747 or a 777. This is where my memory fails. This plane is smaller than the A340 but bigger than the first three I mentioned. Perhaps Alex will chime in and update this for me. This bad boy is hard to miss. Two rows that run the complete length of the plane, this is a monster, capable of holding 853 people in one flight. As a long haul plane with lots of capacity, I first saw them in Emirates livery at LHR, although there is one that flies into San Francisco for Lufthansa every day. I have yet to fly on one but with a new Australia to DFW route that skips LAX, I’ll be sure to try it the next time I have to head down under. There are other planes out there. I’m old enough to remember the DC-10, with its three engines including the dodgy one in the upright stabilizer. I see one at RDU flying for FedEx, but I’m told that’s a DC-11. There’s the L1011 (another plane I’m old enough to have flown in) which has an engine mounted on the top of the fuselage in the rear but it exhausts out the tail of the plane. And I did my time on 727s as well as a slew of smaller aircraft. By using Alex’s cheat notes, the last time I was taxied around LHR I was able to feel confident about my identification of the planes (including the pair of A380s side by side at the Qantas terminal – yowsa). I saw a slew of 747s and 777, plus a large number of A340s and other craft, including what I assume is a retired Concorde parked off to one side. I did see a strange one though – a passenger jet with four small engines but the wing was mounted high – I want to say it was above the cabin windows. But then again, maybe not. Alex would know. Last week I had the pleasure of teaching an OpenNMS course in London. We’ve been doing some work with BT (British Telecom) and part of that involved training. The hardest part in doing training outside of our main office is finding a place that also has computers we can use. It dawned on me that Red Hat has a London office, so I sent a few e-mails and they were gracious enough to loan us both a conference room and a mobile classroom equipped with nice laptops. I think I need to make it a tradition to visit as many Red Hat offices as I can (grin). The office is on Baker Street (yes, that Baker Street) which is in Mayfair, a very posh section of London. It’s home to Selfridges on Oxford Street, a Harrods-like huge department store, as well as a slew of expensive cars: Bentleys, Rolls, Aston Martins as well as Ferrari’s and Mercedes. Not that I had too much time to spend looking at the sights. I was there to teach a class and I am in the middle of totally redesigning it, so my first couple of nights were spent working on slides. On Thursday, however, my friend Jonathan Sartin (OGP) had invited me to see a presentation on “The Universe Within” at the Royal Institute by professor Neil Shubin. We got there a bit early, so I grabbed a local ale and we waited for Craig Gallen (OGP) to show up from the Royal Society (a different “Royal”). The auditorium was pretty full and steeply pitched, which reminded me of some of the many colleges I attended. Shubin is best known for finding a transitional fossil named Tiktaalik in the arctic region of Canada. A good portion of the hour long presentation was on finding it, starting with looking for fossils along the highways of Pennsylvania. As my family is originally from there, I can remember driving by these hills that were steeply cut so the road would run straight and you could see the different strata plainly. He was looking for fossils in the Devonian era (about 375 million years ago) specifically for an animal that closely resembled a lobed fish but with the flat head and neck of the later land dwelling amphibians. After several years he found it in Tiktaalik. The talk was good, but at one point he mentioned that the Earth was actually speeding up and the days were getting shorter. This didn’t sound right to me, as I remember once in high school actually calculating the effect the Moon has on the Earth’s rotation and that it was slowing down (through its influence on tides). Furthermore, it would slow down until the rotation of the Earth (a “day”) matched the rotation of the Moon, which is a little more than 27 current days. When that happens, the Moon will spiral into the Earth, causing a few traffic jams and flight delays. Actually, the calculations showed this was to happen in about 7 billion years, and by that time the Sun will be a Red Giant with a diameter out to about the orbit of Mars, so no worries. Anyway, when question and answer session happened, I decided to call him on it. He pretty much corrected himself, “It *is* slowing down, the days are getting shorter … I mean longer. Did I say shorter? I meant longer” and left it at that, but Jonathan gave me points for asking a question at the Royal Institute on my first visit, and one meant to correct the speaker at that. On the way out, I noticed that there were chargers out front for electric cars. Cool. When I mentioned I was in London, Alex Hoogerhuis, an OpenNMS guru and current resident of Norway, decided to fly in for the day and visit with me. It was fun. We walked down the road to a pub called “The Pheasant” and had a nice meal, and afterward went to the lounge and talked about planes. He taught me the easiest ways to identify the most common commercial jets and I plan to write that up at some point. The next morning we took a cab to Terminal 5 at Heathrow. Since he no longer has elite status I was able to get him into the BA lounge, and he was able to show me a really cool, almost hidden section of the lounge where we waited for our gates to be announced. It was a fun visit and I hope to be able to see him again soon, which will probably be at the OpenNMS Users Conference in March – the OpenNMS event of the year.